The last time was Debbie Allen in 1982. Every single one of the nominees for the 2017 Golden Globe for Best Actress in a TV Comedy or Musical showed up to the awards Sunday night ready to slay. But only one could walk away with the award itself. 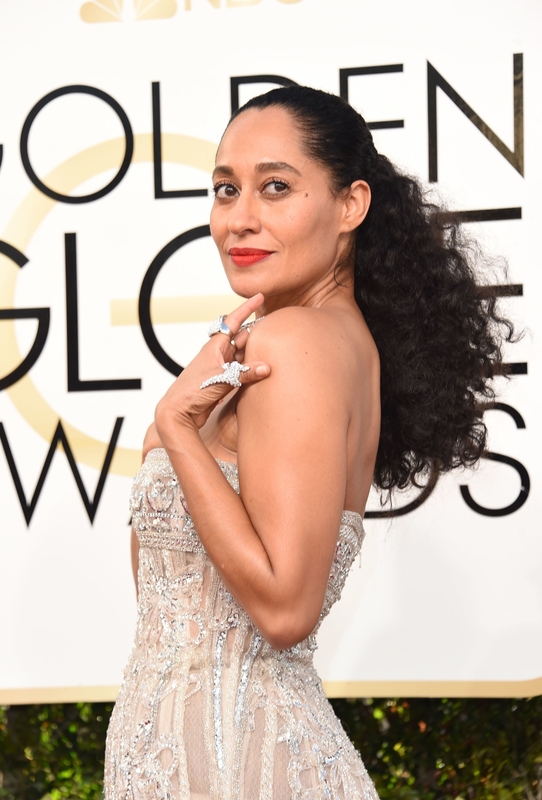 And when Tracee Ellis Ross took home the award for her role as Bow on Black-ish, she also made history. Ellis Ross just became the first black woman to win the award since Debbie Allen won for the Fame TV show in 1982. Allen tweeted her support of Ellis Ross and Issa Rae — the two black women nominated in the category — earlier in the week, congratulating both on a potential win. And then it actually happened!!! In her speech, Ellis Ross said, "This is for all of the women, women of color, and colorful people, whose stories, ideas, thoughts are not always considered worthy and valid and important. But I want you to know that I see you. We see you." In the press room after her win, Ellis Ross talked about diversity in the entertainment industry, noting that "It’s very special to me, and it’s very important — and it’s something we need to continue to do more of." I think that this nomination was really exciting to me … To see the industry look outside of where they usually look. It’s very special to me, and it’s very important — and it’s something we need to continue to do more of. I think it’s not since 1983 that a black woman has been in this category. So I think that our industry really can be at the forefront of making sure that the diversity in our stories is told and diversity is not just being people of color. It's all different ages and shapes and sizes... and making sure that the stories that we tell and how we celebrate those stories actually represents the humanity... I hope that young women continue to be encouraged to be themselves — and not just young women. Young men. All of us. And asked by BuzzFeed News what it meant to her to be the first black woman to win in 35 years, Ellis Ross responded, "I think my shoulders got a little heavier, and I got a little taller all at the same time." Holy moly, when you say it that way. ... Well it means a lot! Goodness. I think my shoulders got a little heavier, and I got a little taller all at the same time. You know, I think that's something that I have to ponder for the next couple of days. Some of it is for me to ponder, and I think more of it is for our industry and all of us to ponder. I think its something that we just to be better at. I think the work is there. The stories are there. And I also feel really special to be in that category with Debbie Allen. Here's to less of a gap between wins for black women next time.